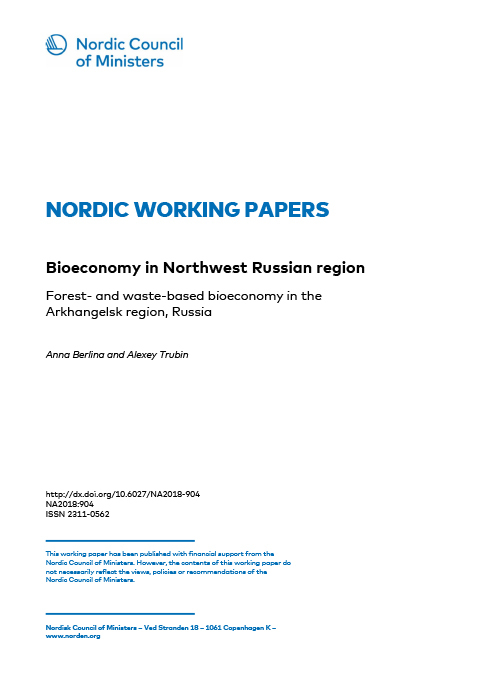 A new study conducted by Nordregio Research Fellow Anna Berlina and Alexey Trubin from the Northern (Arctic) Federal University (NArFU) provides an overview for status of the bioeconomy in the Arkhangelsk region, Russia. It presents key institutions and stakeholders that are driving bioeconomy development in the region, and analyzes key challenges and opportunities inherent in the transition to a more biobased economy. This Nordic working paper is one of the outcomes of the project ‘Nordic-Russian bioeconomy pre-study’ financed by the Nordic Council of Ministers. The study, among other things, highlights the potential for Nordic-Russian business and research collaboration in the field of forest- and waste-based bioeconomy. The overall aim of the project is to form a network and assure long-term cooperation between the Nordic countries and Northwestern Russia that will allow companies, authorities and researchers to work on strengthening the local economy due to a bioeconomic transition. The second stage of the project is planned to be finalised by 30 April 2019.